Patriots are individuals who profess love for and loyalty to their country. As such, expressions of patriotism can take the form of standing during the National Anthem to displaying the flag on one's home. To highlight this sentiment, organizations and individuals are invited to participate in the third Washington state Patriotic Day celebration. 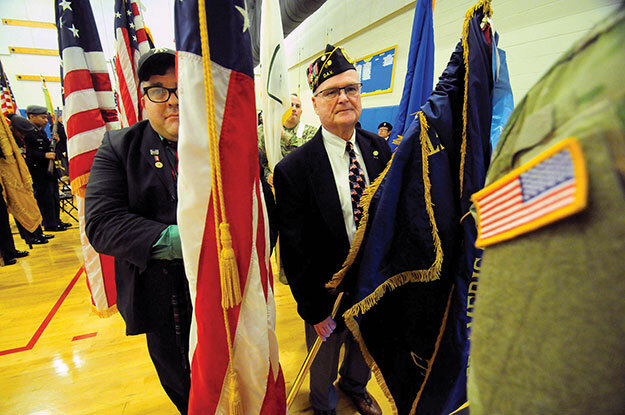 This recognition of patriotism will be held Saturday, Feb. 23, at Stadium High School in Tacoma. Admission to the celebration is free, and the high school's Admiral James S. Russell Navy Junior Reserve Officers Training Corps (JROTC) will sell refreshments. While the event honors the birth of George Washington, the country's first president, it also carries on the Massing of the Colors tradition, which first appeared in 1922. Leading the convoy of organizations to put on the event is the Military Officers Association of America, Rainier Chapter, followed by the Military Order of the World Wars, Puget Sound Chapter; the Tacoma Council Navy League of the United States; the McChord Air Force Base Chapter of the Air Force Association; and the Captain Meriwether Lewis Chapter of the United States Army. Creating the atmosphere for the day will be various area patriotic organizations, JROTC cadets from various high schools, and America's First Corps Band. "This world-class band creates a bond between the United States Army and the Washington state community," the event's press release says. Adult and youth organizations have until Thursday, Feb. 21, to register. There will be monetary awards to organizations that have the best spectator attendance. All participants are asked to be at Stadium High School by 1 p.m.; parking on the street and in the school's parking garage is free. For further information about participation and regulations, visit the website or email Col. Carroll Dickson at carrolldickson@comcast.net.